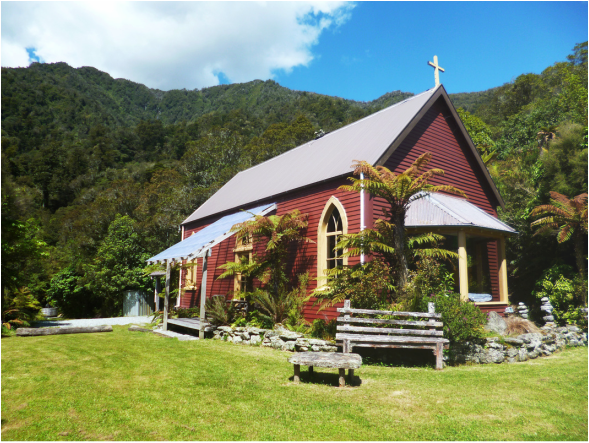 The Hidden Valley Lodge is a renovated historic church in a unique secluded bush setting featuring panoramic views overlooking the lake and mountains on our farm surrounding the shores of Lake Poerua. The Lodge offers the perfect West Coast retreat for a special weekend getaway or an unforgettable family holiday. "What an amazing place. Had a fantastic time here, great location, clean, well maintained and the wood fired tub is great! All in all, one of the best places we have ever stayed in and we have passed on to many friends to go and enjoy as well. Thanks so much for sharing this special place with us. Will be back." The Hidden Valley Lodge has been renovated with special attention to keeping the unique heritage of the building intact through stained glass windows, arched ceilings and the use of rich native timber. There are plenty of fun activities for kids and adults alike. Explore the lake, go for a day trip to Punakaiki, embark on spectacular bush walks or relax in the hot tub under the stars. The Lodge overlooks beautiful Lake Poerua, an important food source for the early local Maori tribes. Enjoy fishing, swimming, kayaking, boating and relaxing on the shingle beach. Copyright © Hidden Valley Lodge 2014. All Rights Reserved. No part of this website may be reproduced without the owner's express consent. All images are original (unless otherwise stated) and are not to be used elsewhere.